I really do not understand what I have done wrong. Every time I have had a shower since the plumber came and installed the new unit, I have thanked you and felt deep gratitude for the hot water at the flick of a switch. I have been careful with my water use and I gave you a tribute: I donated money to Water Aid so that other people, less fortunate than me, could access clean water. Was it because I had a bath yesterday? Do you feel that I have been unfaithful to you? Honestly, I just wanted to soak in some warm water for a while and relax my muscles. I feel that refusing to let me wash my hair afterwards under the shower was a bit petty. I know that the shower itself is not broken and that it is the electrical switch in the ceiling that has failed this time, so perhaps it’s the spirit of electricity who is punishing me, but I can’t help being suspicious since it’s the only electrical problem I am experiencing and it is, once again, the shower that is affected. I consider it particularly mean that you made this happen an hour and a half after the departure of Mr Snail – who could have fixed it (he’s good with electricity, even if he does struggle with carpentry). I also think that making the cord snap as I gave it a sharp tug, so that I got whacked across the back of my hand was just adding injury to insult. I am afraid that you give me no choice but to abandon you and go and have a shower elsewhere… thank goodness for friends. You could have been really spiteful and had another bath! It may come to that! Oh, so exasperating! This is where I go and scuffle in the camping gear, get out the shower bag, fill it with hot water from the bath or basin tap and have a shower without benefit of electricity! Much more of this, and you’re going to be the Snail of Unhappiness…. That is inspired – thank you. I don’t currently have a camping shower, but I will soon. Make sure you get one of the black bag ones. That way if the shower conks out again in the summer you can at least hang it in the sun on the washing line and get hot water for free! Thank you… otherwise I’ll be round with my soap!! The Spirit of Showers has a very malicious side. You’ll have to appease it with a new cord and a prayer of dedication. I think I’m going to make it a little crochet decoration to go on the end of the new cord – do you think that will make it happy? 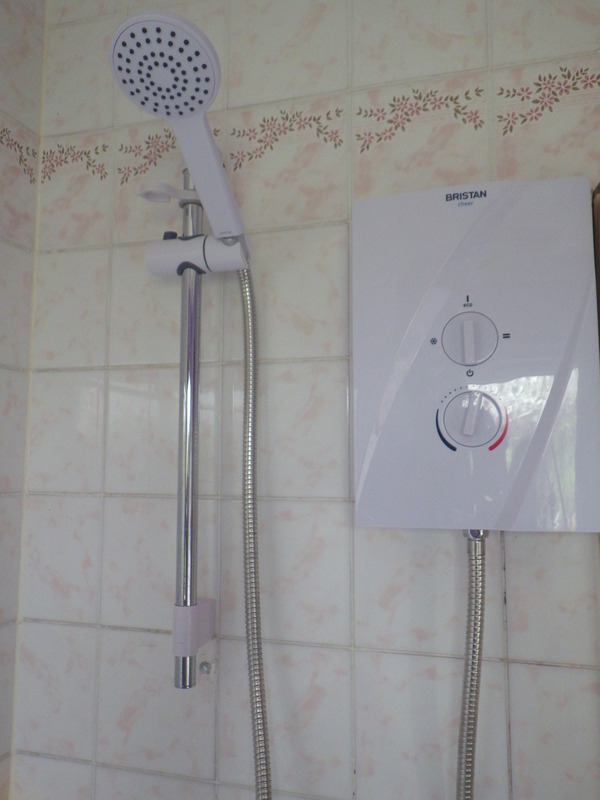 Perhaps the Shower Spirit is done with me and it’s the Electrickery Fairy! I really would not wish this sequence of problems on anyone… she seems to be quite sneaky this spirit, so based on Narf’s comment I’m going to start blaming the Electrickery Fairy instead… just wait for my laptop to explode! Oh, no! I’ve always had problems with the showers in the UK but I thought it was just because I was an American and our showers are so very different! Maybe the problems were never my fault–maybe it was the evil shower sprite, having fun with foreigners! The hot water went off mid-shower yesterday 😦 Shower spirits are mean. Yes. The answer is baths. Which are much nicer anyway, even if they take longer. I would die without my shower. My bath hasn’t been used for its original purpose for years – in fact, I was thinking about mosaicing the sides and planting it up with succulents. I would miss my bath if I didn’t have it, but only occasionally! I’d love to see your bath if you ever do convert it to a succulent planter.